Kids just love toy vehicles, but especially trucks! They’re fascinated with what they do, their size, and how they move. Toy trucks make wonderful gift ideas and come with different functions, moving parts, fun sounds and more. So whether your toddler wants to be a fireman, a garbage collector, a delivery driver or any other kind of truck driver, there’s a toy truck available to suit their tastes. Toddlers love trucks they can load and unload over and over again with different objects. They find it captivating and it gives them pure enjoyment! With so many choices available, it’s not easy to pick the safest toy truck for a 1 year old while also ensuring that it will provide them with lots of fun, engagement, and learning. But don’t worry. We’ve sifted through every single one and researched them thoroughly so we can offer you the best of the best. So if you have a truck-loving toddler, then you really can’t go wrong choosing one of the best toy trucks for 1 year olds for their birthday or Christmas from our awesome list. The VTech Drop And Go Dump Truck is the perfect gift for 1 year olds who loves trucks and toys they can push and pull. 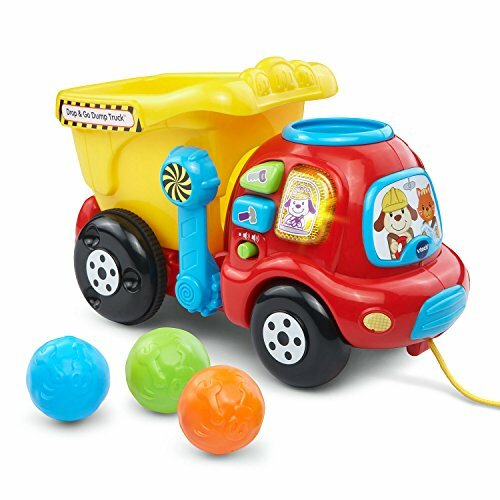 With this Drop And Go Dump Truck, your child will get 3 colorful rocks that they can load and unload to their heart’s content! As soon as your child loads on the rocks, they can pull the truck to their imaginary destination for delivery. When your son or daughter pulls the truck, they will hear a clickety-clack sound which is the truck bed moving up and down with the rocks rolling around inside. To them, it will feel like they are driving a real truck! Once your child reaches their imaginary destination, all they have to do is lift the truck bed to tip the rocks out. Then back again for another load! The great thing with this truck is that your child can put anything they want into the bucket for wonderful imaginary and storytelling play. In addition to this, there are 3 colorful buttons on the side of the truck with graphics on them. When your child presses them, they will hear melodies and phrases that teach them the names of the tools and colors. There is also a volume switch on the side which parents will appreciate and this colorful truck for one year olds comes with 2 AA demo batteries. If you’re looking for a fun and engaging toy for your toddler, then the VTech Dump Truck comes highly recommended and is suitable for both boys and girls. Several parents shared that their child was captivated and fasincated by it from the moment it arrived! This Dump Truck is tons of fun as kids love pulling it, pushing the buttons, loading and unloading andmore! There is something about recycling trucks that kids just love, so what better gift for your one year old than their very own Green Toys Recycling Truck? What makes this truck special is the fact that it has recycling chutes on both sides and a bed that tilts back. And for even more excitement for your child, the rear doors open and shut, just like on a real garbage truck! Included with this gorgeous truck are cardboard pictures of recyclable material, such as an aluminum can, a newspaper, and a plastic bottle. You just need to cut them out so your child can use them with the truck. The chutes on each side are labelled for recycling cans, bottles and paper. Through using these, you can teach your child all about recycling while having lots of fun! When your child learns what each carboard cutout is and which chute is should get place in, then they can have great fun putting them in and then tilting the truck bed back to unload! Can you imagine the fun they will have, as to them it will feel like they are operating a real garbage truck! A number of parents shared with us that their kids also loaded up crayons, Shopkins toys and other small toys for evern more fun. 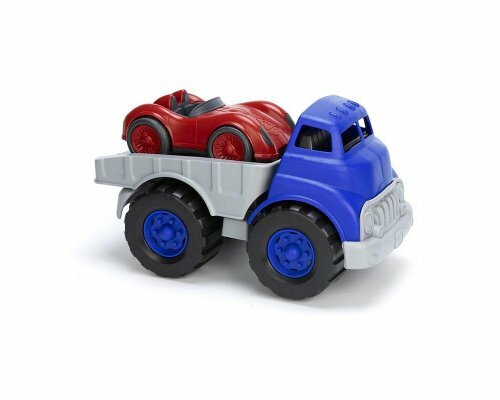 This truck is made in the USA from recycled milk cartons by Green Toys and is BPA and Phthalate Free. Several parents said that this Green Toys Garbage Truck was a huge hit with their kids and held up extremely well to rough play. The Green Toys FlatBed Truck And Race Car is two toys in one which your one year old boy or girl will love! It comes with a bright red race car loaded onto a beautiful flatbed truck. All your child needs to do if they want to unload the car, is tilt the flatbed back and the car will roll off. This is a great toy truck for 1 year old boys who love race cars as well, as they can play with them together or play with each toy on its own. 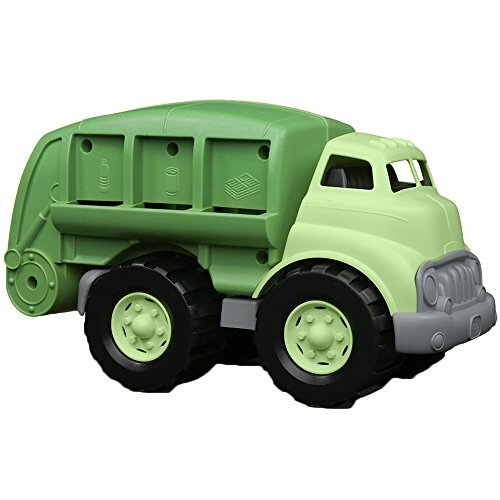 Green Toys are renowned for their quality and eco-friendliness, and this toy truck is no exception. Made in the USA from recycled milk jugs, your child can enjoy playing with it indoors as well as outdoors. There are no metal axles for you to worry about and the truck and car are both BPA, PVC, and Phthalates Free. Several parents share that this toy truck and race car was a huge hit with their child and they love that there are no sharp edges for them to worry about. Toddlers have a blast with this eye-catching flatbed truck and toy car! The Green Toys Fire Truck is one of the most fun and entertaining toy trucks for girls and boys alike! Available in Red or Pink, this fire truck looks very realistic as it has Green Toys Fire Department written on the main ladder. In addition to that, the GTFD (Green Toys Fire Dept.) shield is on both doors. Your one year old son or daughter will be delighted when they realize that they can raise and lower the roof ladder and also pivot it 360 degrees! Can you imagine the fun their will have playing pretend fireman or firewoman, rescuing their other toys from imaginary fires or their stuffed teddy stuck up high on a chair! 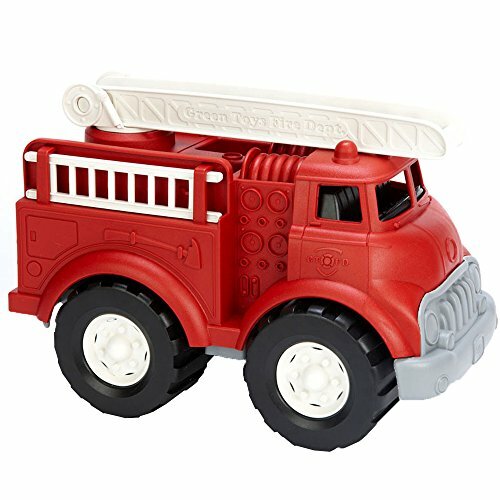 Made from 100% recycled milk jugs and packaged in recyclable material, this Green Toys Fire Truck is BPA and Phthalates Free and made in the United States. The axles on the truck are not made out of metal which makes it suitable for 1 year old toddlers and gives parents peace of mind. Both ladders can be removed from the truck and it’s suitable for playing with indoors and outside. A wonderful gift idea for Christmas, birthdays or any other special occasion for kids who love toy trucks. Great fun truck for both girls and boys! This adorable set of WolVol Push And Go Friction Powered Trucks is a perfect gift for any truck loving 1 year old toddler on your list! 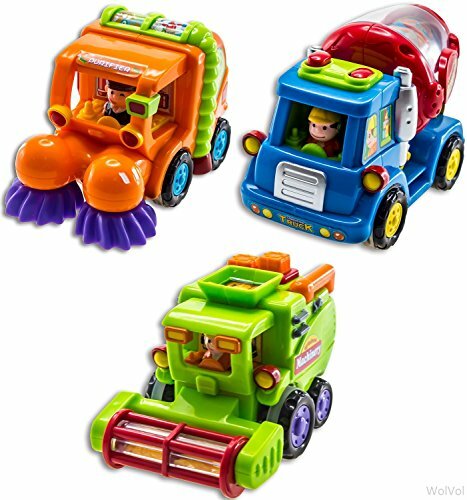 This fun set consists of 3 detailed and colorful work trucks; an orange street sweeper with purple brushes, a red cement truck with a blue mixer and a bright green harvester (combine) with a red header. With no batteries required, what’s really cool about these sturdy little toy trucks is that all your toddler has to do is push them forward, let them go and watch them do their thing. The friction motor propels them forward. Each truck has an automatic rotating function, so once the trucks are in motion, your child will love watching the action as the street sweeper’s brushes spin, the cement truck’s mixer turns and the harvester’s header spins. Each cute little toy truck measures 4.5″ X 3″ X 3″ and they’re great for kids age one and up. While the manufacturer has geared these Friction Powered Trucks to boys, a lot of parents and grandparents bought them for girls who absolutely adored them! These cute and well made friction toys can be taken anywhere and make wonderful birthday or Christmas gifts for any boy or girl.